Co-produced by Intima and Cona Ljubljana. Arctic Internet Ballet - live Internet broadcast from Svalbard, Arctic Ocean, on Wednesday, 31 December 2008 at 23:55 PM Central European Time (GMT/UTC+1). Ballettikka Internettikka is a series of tactical art projects by Igor Štromajer and Brane Zorman which began in 2001 with the exploration of Internet ballet. It explores wireless Internet ballet performances combined with guerrilla tactics and mobile live Internet broadcasting strategies. After invading The Bolshoi Theatre in Moscow (2002), La Scala in Milan (2004), The National Theatre in Belgrade (2005), Volksbühne in Berlin (2006), the City Hall and Lippo Centre in Hong Kong (2007), a construction site in Seoul (2008) and other institutions and their concepts, Štromajer and Zorman - with the help of two executants on the spot - prepared a new arctic / midnight / New Year's Eve internet ballet - Ballettikka Internettikka Norddikka, broadcasting live from the Olav V Land glacier (78N, 17E; more than 4,000 m2) at Spitsbergen, Svalbard, Norway, Arctic Ocean. Robots often cry - why shouldn't you? 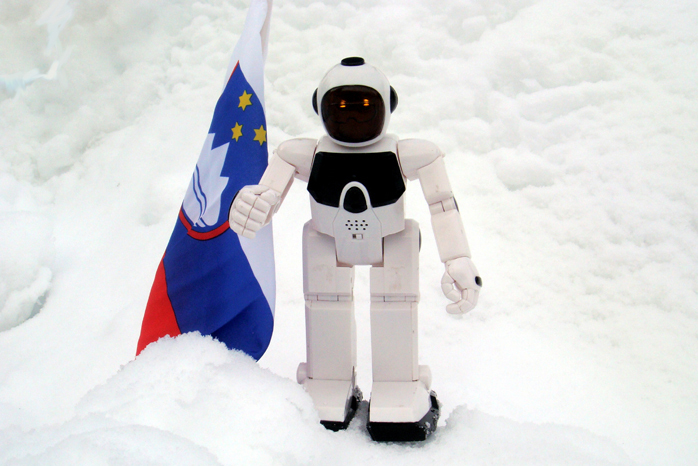 Štromajer and Zorman conducted and monitored the complex operation of leaving, jilting the robot in the deep snow of the white spaciousness of the Arctic glacier (Olav V Land, Svalbard) on New Year's Eve. They were located in their Control Center in Ljubljana (CCL), Slovenia. Receiving instructions from CCL, two executants, Nils Are Mohn and Åsmund Njøs, keepers of the Indian research base on Svalbard (NCAOR - Indian National Research Centre; opened in July 2008 in collaboration with the Norwegian Polar Institute, as one of the twelve international permanent research bases in Svalbard), executed the intimate act of jilting the robot on the glacier. 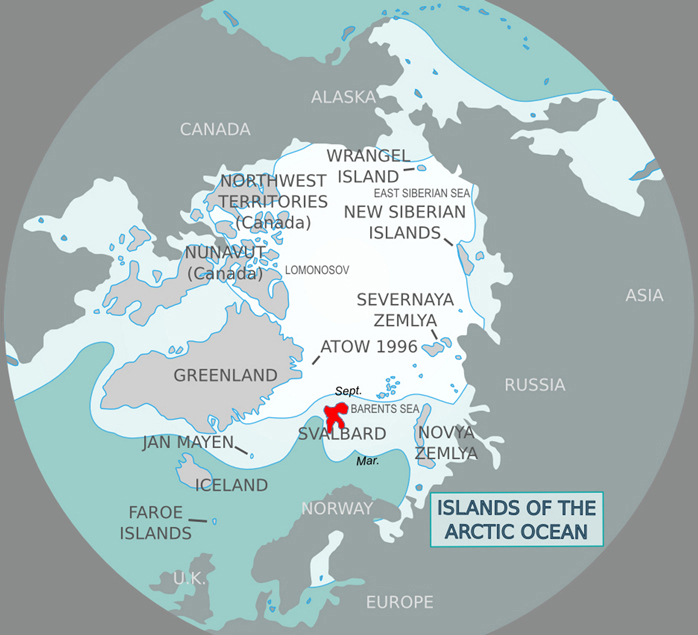 Mohn and Njøs started their journey to the foothills of the Olav V Land glacier seven minutes before midnight. They were in permanent video contact (UMTS webcam) with the CCL. 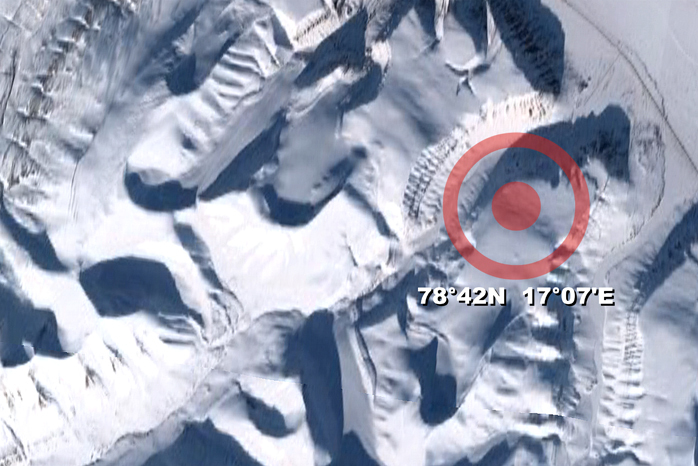 Exactly at midnight (Central European Time / also local Svalbard time), when the year 2008 turned into 2009, they reached Point Zero (78N, 17E) and prepared a platform for the robot, using a small snow shovel. 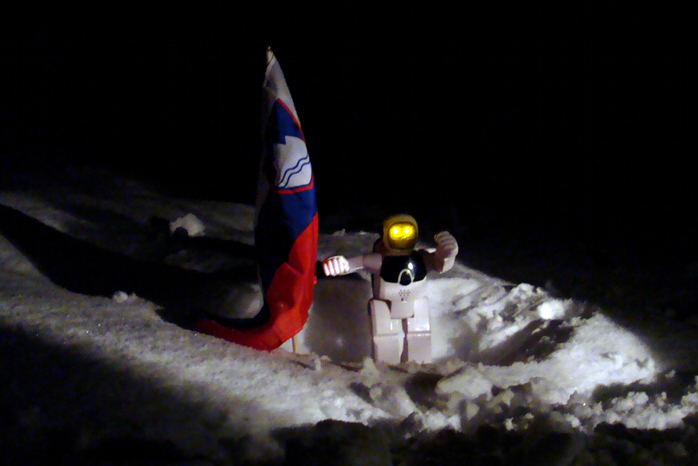 They also thrusted the Slovenian national flag into the snow next to the robot. The action was performed in the complete dark (civil polar night). Live broadcast lasted 10 minutes, starting 31 December 2008 at 23:55, ending 1 January 2009 at 00:05.